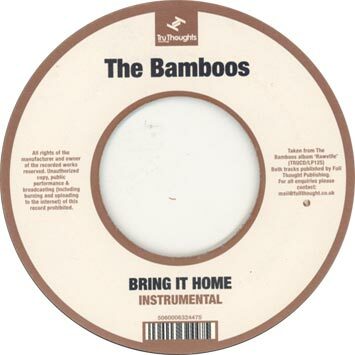 'Bring It Home' is the superb second single from The Bamboos new album 'Rawville'. The single features sassy soul vocals from Alice Russell, who is currently working on songs for her next solo album with TM Juke as well as tracks for the next Massive Attack album. 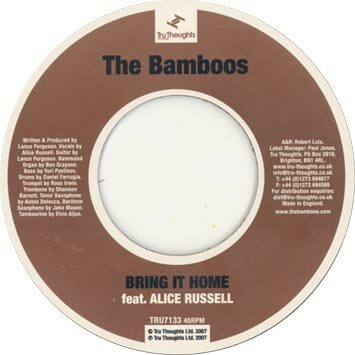 For this track The Bamboos wanted to create a rimshot-type groove like the James Brown track 'Licking Stick' combined with the 'woman done wrong' theme of tunes such as 'Message From The Soul Sisters' by Vicki Anderson and 'You're Losin' Me' by Ann Sexton. This classic soul/funk track is the story of a woman who tells her man to 'take care of business' (the intimate variety) or she'll walk. All lyrics are written by Lance Ferguson of the Bamboos. Lance is currently working on a remix of 'Bring It Home' for his solo project as 'Lanu'. The Bamboos have just finished a successful European tour where they converted a huge number of people to their unique funk sound with their super tight live performances. The Aussie deep funk seven-piece use this song in their live performances as a vehicle to show the audience how they 'build The Bamboos funk'. The song is broken down to the drums then all the other instruments are added in one at a time. The Bamboos are currently playing album launch gigs in Australia and their track 'My Baby's Cheating' from the new album 'Rawville' has been licensed to Paramount for the Transformers movie in the USA. To find out what the band got up to on their UK tour visit their blog page: www.myspace.com/thebamboos or for a list of their australian tour dates visit www.thebamboos.com.